The Reef Adventureland Motor Inn is located in the heart of Tannum Sands just 9 kilometres from the Bruce Highway. Tannum Sands is known for its long white sandy beaches and excellent swimming, sailboarding and surf-skiing. Patrolled weekends and holidays by the Lifesaving Club, Tannum's waters are some of the safest in Australia. Since the water temperature here varies only a few degrees through the seasons, you can enjoy swimming year 'round. It's not surprising so many people are making Tannum their destination for the annual Northward "winter migration." For picnics, barbecues and general family fun, the beautifully landscaped, $3 million parkland development known as the Millennium Esplanade is your obvious choice. The manicured parklands of the Esplanade run the length of the Beach, offering a selection of scenic spots for cookouts, picnics, bicycling, walking and all kinds of recreation. Equally rewarding for nature lovers are the Turtle Way and Canoe Point Environmental Park and Botanic Walks Park. You can enjoy over 15 kilometers of protected natural scenic areas winding their way along the beach and up the Boyne River. Bike and walking tracks let you fully explore the reserve's bushlands, windswept dunes and parklands. At the South end of the main beach durning low tide you can cross the Wild Cattle Creek - on foot - to reach Wild Cattle Island National Park; an unspoiled sand Island that is quite picturesque - particularly at sunset. Numerous "grey" Kangaroos and Wallabies make the Tannum Sands/Boyne area their home. Ranging from small to medium size, they're especially easy to find in and around the Canoe Point parklands. Stop at the Visitor Information Centre near the main beach for more information on golfing, bowling and boat ramps, as well as specialty accommodations such as Caravan Parks, Bed and Breakfast and Holiday Cabins. Boyne Island is an interesting mix of residential, light commercial and heavy industrial lifestyles, all coinciding in one beautiful, natural environment. 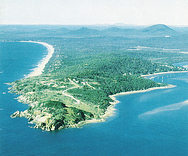 Boyne Island is renowned for it's beautiful foreshore parks, and one can also access its beaches via 4WD vehicle. Calliope shire issues a permit for this activity. Located on Boyne Island just outside the township, Boyne Smelters produce aluminum for markets throughout the world. About 800 people work here in Australia's largest aluminum smelter to produce approximately 500,000 tonnes of metal per year. A visitor information centre operates at the smelter where a video of the smelting process can be viewed as well as printed material. Regular tours are offered at the Smelter Visitor Centre on Tuesdays. We suggest you call ahead for exact times and other details. To reach Boyne Island by car take the Oxley Bridge from Tannum Sands or the Bruce Highway from Gladstone. At the forefront of Queensland development, Gladstone is known as both an ideal setting for career and family life and a growing center for tourism. It's a place where business and community have partnered successfully to foster and maintain a higher quality of environment and lifestyle. Named after the famous English statesman, the award-winning city developed around its sheltered, deep water harbour, Port Curtis. Nearby is the recently redeveloped central shopping area; a tree lined drive through open area of commerce. Gladstone is a premier port city, and hosts several of Australia's most significant industries including power generation, aluminum and coal. Yet after hours the city retains the charmed lifestyle of a coastal resort in a soft, semi-tropical environment. While in Gladstone, check out the waterfront and modern Marina or stroll through the campus of Queensland University for a bit of local flavor. You're also sure to enjoy the greenery of the Botanic Gardens or visit an exhibition at the Art Gallery. Several prominent lookouts will deliver spectacular views including an overview of the world's largest alumina plant. And when it's time to eat naturally the locally caught seafood is the way to go! You'll find the Visitor Information Centre at the Marina, open seven days. Following the Boyne river upstream about 20 minutes and you will reach the Lake Awoonga Recreation Area, a beautiful spot with Mt. Castle Tower National Park in the background. The recreational parkland areas feature numerous sheltered BBQs, guarded swimming areas and rest facilities. Stroll through the parklands on the well marked walking trails to enjoy the area's diverse flora and fauna. Kroombit Tops forestry and National Park covers an area of some 34,400 hectares. Approximately one hour's drive west from Boyne Island, the densely forested sandstone escarpment here rises dramatically to 800 meters in places, with high ridges and deep gorges carving its unsurpassed natural beauty. Stand atop the escarpment and it's not hard to imagine the awe of early explorers' as you survey the deep rainforest and rolling country to the East. For those who crave closeness to raw, untamed wilderness, this area makes for a satisfying, yet easily accessible day's outing. Day and overnight 4WD safaris are also available from Gladstone. Please enquire at the Gladstone Information Centre. There are several reasons to pause your journey in Miriam Vale. One is the charming, old style main street with its numerous antique and gift shops. Then there's the famous mud crab sandwiches at several good cafes. The Discovery Coast Information Centre at Miriam Vale is open daily. The ideal spot for rest, refreshment and planning! With it's smooth predictable waves, Agnes Water is the northernmost surfing beach in the East and legendary with surfers. Well patrolled by lifesavers during peak seasons, it's also very safe for swimming, with marked areas. In town you can find all the necessities including tavern, chemist, shopping centre as well an excellent museum of maritime history. Minutes from Agnes Water, the Town of 1770 commemorates the arrival of Lieutenant James Cook and his Endeavour crew made their 2nd landfall on the continent here on 24th May 1770. Recognized as the Birthplace of Queensland, much of the town and surrounds are preserved, with annual historical reenactions. Stop and enjoy the magnificent views north across Bustard Bay and the many colorful craft anchored nearby. This is also the place to join one of several outstanding day cruises to awesome coral cay Lady Musgrave Island where you can bask in the sun, snorkel the incredible undersea world of a coral reef, explore the Island, and more.